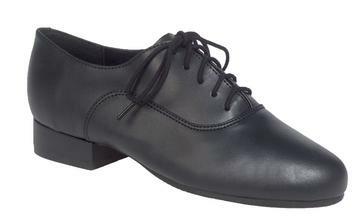 Mens Character Shoe by Capezio. The lights go down and the music swells. The overture has begun. You stand behind the curtain waiting for it to rise, eagerly awaiting your cue. This men’s oxford features a PU upper and leather sole construction. With a padded heel topline for comfort, this shoe is the perfect all- purpose choice for your Broadway debut.